A large-scale renovation has ended in the White House, within the framework of which, in particular, the interior of the working cabinet of the US President has changed - according to the tastes of the new owner. 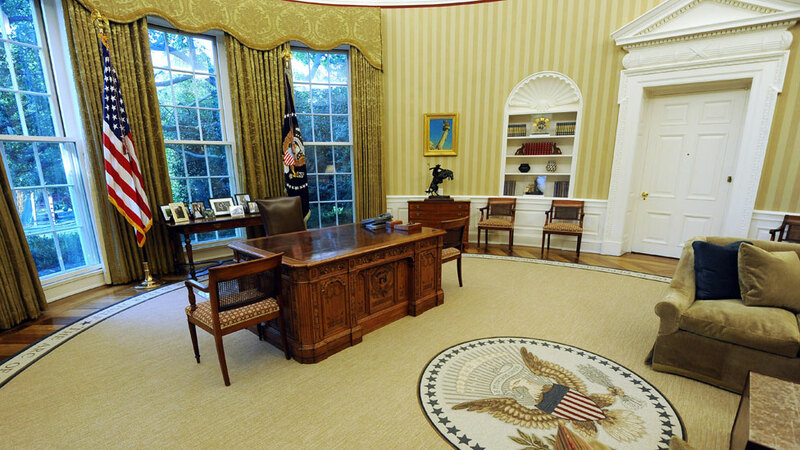 On the left of the collage is a photograph of the Oval Office, taken after the previous repair, in August 2010, when Barack Obama was elected as the host of the White House in 2008. To the right is a photo of the same cabinet seven years later. Of all the furnishings, it seems that only the table, chairs and a small table for photographs by the window remained intact. Quite a few differences, but we want to draw your attention to the most obvious. Despite Trump's famous love for lush interiors, he got rid of the golden-yellow wallpaper of Obam’s times and replaced them with more neutral ones, with a barely visible pattern. 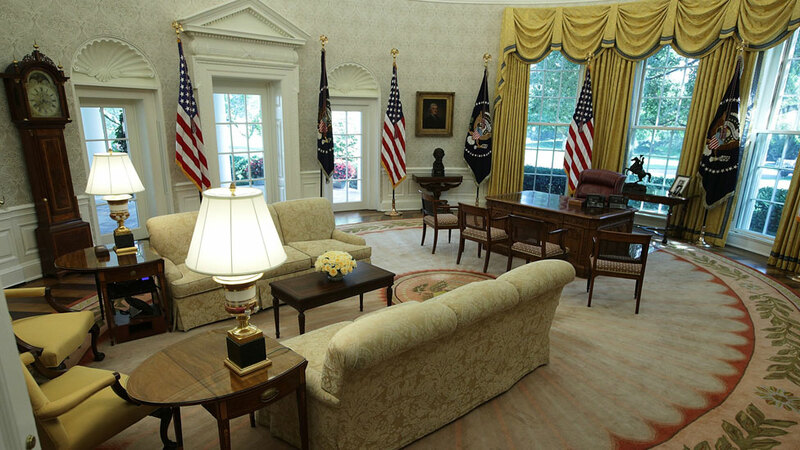 The parquet of the Oval Office traditionally covers the same form with a carpet, in the center of which is the American coat of arms. The coat of arms remained in place, but the Obama rug of straw color was replaced by a brighter one, with a floral pattern around the perimeter and light "rays" diverging from the center to the red frame. Thin curtains with an exquisite gold pattern gave way to a more dense drapery - the same shade, but less catchy, with a blue border and a heavy folded lambrequin. On the window behind the Obama’s back you can see a dozen photographs from different years: with your wife, children, employees and visitors to the White House. There are black-and-white among them, but mostly they are colored, and in the center is a wedding shot (Michelle Obama’s white wedding dress can be seen even from this angle). On the table at Trump, who was married three times, only two photos - both black and white. Obama's work chair looks more like a chair: a narrow back without a head restraint looks rather ascetic against Trump's massive maroon seat. There were only two of them in Obama's office: the US state flag on the right hand of the president and the presidential standard on the left. Trump, obviously, prefers a more magnificent design - in his office panels a dozen. And on the left hand of the president put military banners: the US Army, Marines and the Coast Guard. The picture of Obama’s office clearly shows the picture hanging to the right of the window - this is the face of the Statue of Liberty and a hand with a torch extended upwards. On the other hand, the canvas by Impressionist Childe Gassam "Avenue in the Rain", depicting US state flags hung from a window, was hanging. Trump replaced both pictures: on the site of the Statue of Liberty there is now a portrait of the 7th President of the United States Andrew Jackson, who hung in the office under Lyndon Johnson, Ronald Reagan, George W. Bush and Bill Clinton.